Want to stay in, but eat like you’re out? Here, chef and writer Heather Platt shares recipes inspired by L.A.’s hottest restaurant dishes. We say “inspired by,” as these creations are Platt’s own and have been adapted for the home cook, using easy-to-access ingredients and techniques you can pull off in just about any kitchen—yes, even yours. The Real Thing: While skimming the menu at Musso & Frank, you could easily miss the Welsh rarebit, filed under “Classics Made to Order” alongside Grilled Lamb Kidneys and Calf’s Sweetbreads. 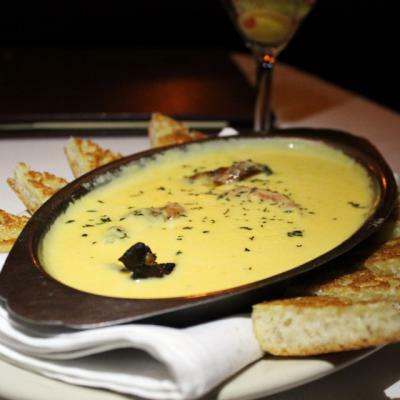 This would be a travesty, as dipping toast points into a succulent combination of melted cheese, bacon, and ale while sipping a perfect martini at the almost one-hundred-year-old Hollywood haunt is transportive. It’s one thing to feel like you’ve gone back in time to Hollywood’s golden age; It’s another to taste it. Traditional Welsh rarebit is served drizzled over toasted bread. 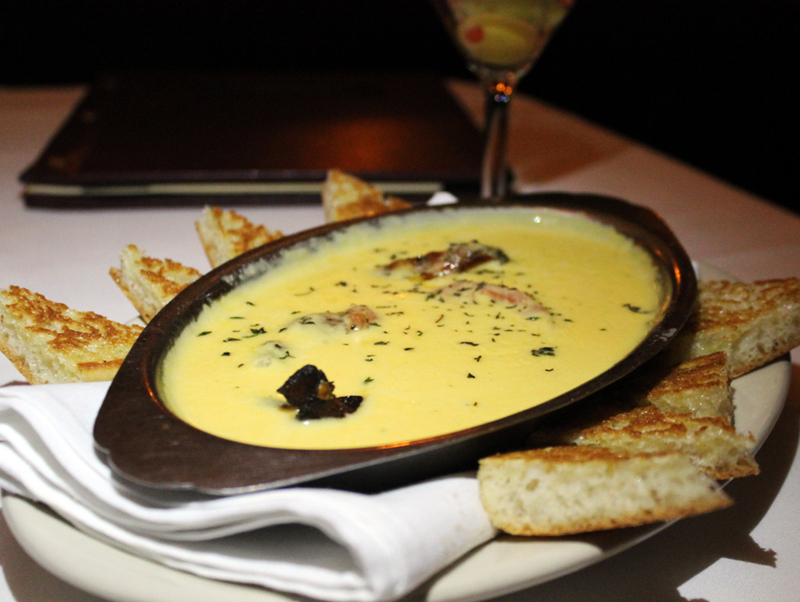 But Musso & Frank serve theirs fondue-style, with bacon and tomatoes, making it a wonderful, shareable first course. The Hack: Like any classic restaurant dish, Welsh rarebit is easy to make and tastes amazing at home—no special occasion required. In the vein of Musso & Frank’s bacon-infused version, I used bacon fat to start the roux at the base of the super-thick sauce. It doesn’t take long to make, just a bit of whisking. You’ll want to throw a dinner party just to share this one. Cook the bacon in a skillet over medium heat until crispy, about 5 minutes. Remove bacon from pan and pour rendered fat into a small bowl. It should be clear and without brown bits. Set aside and reserve. Preheat oven to 400 degrees F. Cut the tomatoes into 1/2 in slices. Coat an ovenproof pan lightly with olive oil. Lay tomato slices flat in the pan, drizzle with olive oil and sprinkle with salt. Roast for 20 to 25 minutes. Meanwhile, in a medium saucepan over medium-low heat melt the butter with 1 tablespoon of the reserved bacon fat. When the butter begins to foam, add the flour and whisk rigorously to combine. Whisk in the mustard, cayenne and paprika. Add the Worcestershire, whisking constantly. Gradually pour in the beer followed by the milk, making sure each has been completely combined. Add the grated cheese, one small handful at a time. Whisking until smooth before adding the next handful. When all of the cheese has been added, turn the heat down to its lowest level and whisky in the egg yolk. Pour the hot rarebit into a serving dish. 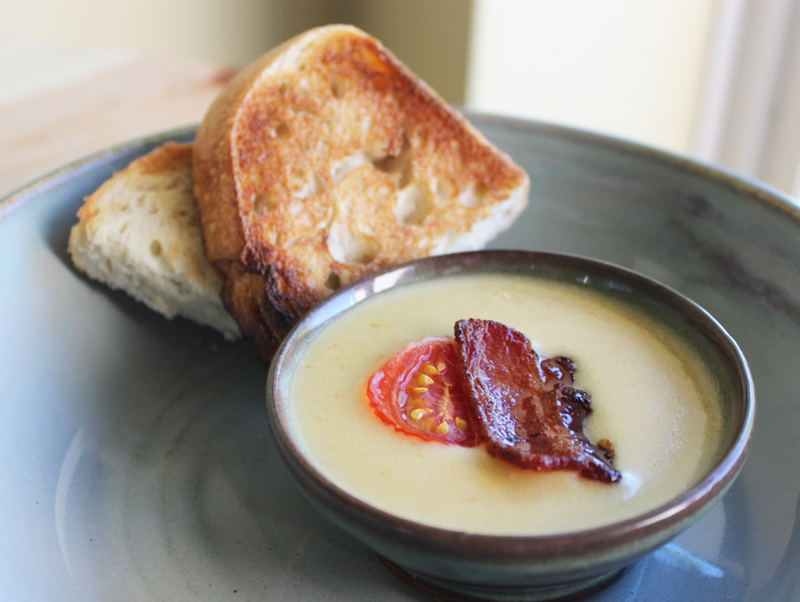 Garnish with crispy bacon, roasted tomato slices and served with toasted wedges of crusty bread for dipping. The rarebit can be served immediately or placed in the hot oven for 15 minutes to create a nice bubbly crust. For full effect, eat while in the presence of something old—with a martini.